At the festival, you can get inside of an igloo and toss money into the offering box in the center in honor of the water deity. When you toss the coin, you can pray for the safety of your house, the prosperity of your business and the success of harvest. 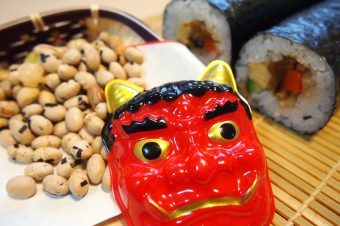 Nowadays, children invite people to go inside of the Kamakura and entertain guests while serving any Amaeko (sweet sake) and rice cakes. Then, guests offer the coin to the Japanese water deity. Contributing to the water deity is said to bring good luck upon the well water that farmers use for their crops. In 1969, more traffic arose, and less Kamakura were made due to regulations by the city government. This issue caused “the movement of mini Kamakura” and it turned into a new street of kamakura, now called Kamakura Street. That’s the reason why there are “mini Kamakura” now. You can experience building “kamakura” at this location. The view of several kamakura gathered together, with candles lit inside them, is absolutely beautiful. There is even a cute kamakura, which has a heart-shaped entrance. You can get a free bus ride to see the kamakura around this location. I strongly recommend you experience this unique festival. Yokote is located in Akita prefecture.The best way to go to Yokote is by shinkansen. 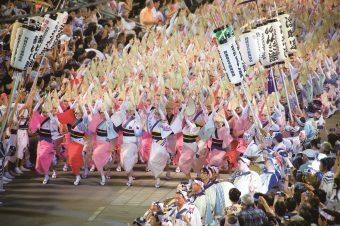 The festival of Sukagawa Taimatsu Akashi boasts a history of over 400 years. It is one of Japan’s three main fire festivals. It is said to have begun as a way to mourn the spirits of the soldiers who lost their lives when the army of Date Masamune attacked Sukagawa Castle. Giant torches 10 meters in length and 3 tons in weight are carried around the town by the youths of Sukagawa. They are taken to Gorozan where they are set alight. When the Great East Japan Earthquake of March 11 hit, it made the local people of Sukagawa worry and wonder whether the festival should be held or called off. This is because a great deal of people died and suffered from losing their friends and family in that year. After deep deliberation, the people of Sukagawa decided to hold the event in order to mourn the spirits of the people who died in the earthquake and tsunami and hope for recovery from it. The people who held this event hoped to help the suffering people find hope. Unfortunately, the people of Sukagawa were not in the clear yet. 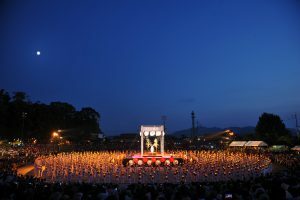 They soon realized that the torches made in the Fukushima prefecture were polluted by nuclear radiation so they couldn’t use them for the festival. The people of Sukagawa asked all over the prefecture for support to get torches. Fortunately, the entire region supported them as much as possible so they could hold the event safely. The hard work of the Sukagawa people to make sure this festival occurs is evidence of what a valuable and precious festival it is. It is surely one worth seeing for yourself. It is in Fukushima Prefecture in Tohoku area. It is in the countryside of Japan, so renting a car would be helpful. You can also use the Shinkansen or Express Bus to access from Tokyo. 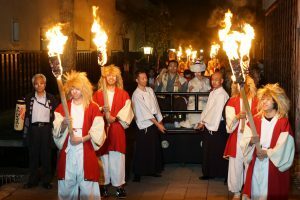 The Hida Furukawa Kitsune Fire Festival is organized at night once a year and is based upon a fairy tale from the Gifu Hida Furukawa region. 400 years ago, there was a wedding ceremony for “Otonosama” (the king living in Furukawa) and for “Okon” (the daughter of the fox god). The ceremony begins from the Mikura Inari shrine. Through the town, over 50 people carry torches and lanterns and several dances are performed by daughters. After the ceremony, you can see a dance, which is for strengthening the groom and bride’s connection. You can also see a 5-meters long rope, called the big snake or “Dangomaki,” which brings prosperity in business and cerebrates the wedding. Anyone who saw the procession and fox getting married can make a wish, such as “productiveness of grain”, “safety of one’s family” or “prosperity in business”. These main grooms and brides are chosen from applicants from across all the entire country. Anyone can be one of them. On the festival day, all the participants wear special kitsune make-up. At the festival location, general public participants in the procession can also be given the same make-up. The surrounding town will be full of Kitsune-related activities and events, such as special menus at restaurants that tourists can enjoy. You can also enjoy sightseeing in the Hida Furukawa town where they have the Seto River made of stone and you can go sightseeing around the Shirakabe-Dozou houses. There is a station that shows up in the recently hot movie called “Kimino-na-wa” (Your Name Is), which is a “Furukawa Station” motif. If you are lucky enough, you can time your visit perfectly to recreate the scene. The Gifu Prefecture is located in the center of Japan. You can easily access by both Shinkansen or car. According to legend, when the 12th emperor of Japan, Keiko, got near the Yamaga Ohashi shore, he was surrounded by fog. Yamaga civilians hanged torches to make his way travels easier. Because of this legend, the Yamaga civilians later worshiped Keiko at the Omiya Shrine and they donated fire to him every year. 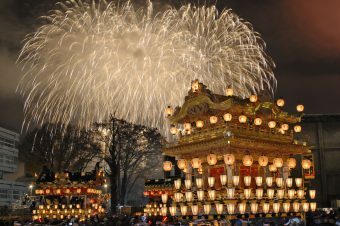 Beginning in the Muromachi Era, paper lanterns turned to golden lanterns, and women put them on their heads and danced. This was called the “Yamaga Lantern Dance.” It became to be called “Thousands People Lanterns Dance” later on, which is its famous name nowadays. Long ago, the technology of making Yamaga lanterns was inherited by the “Toroshi” (masters of making lanterns). 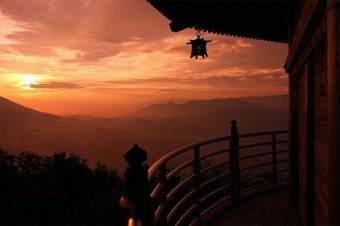 The famous golden lantern, the architectural style of shrines, the Japanese architectural style drawing room, and the constructing of castles are all done by hands. You can see beautiful lanterns at Yamaga-lantern Mingeikan (Yamaga Lanterns Folk Crafts Museum) and the Omiya Shrine and Toroden. The song that is sung and danced to at the festival is called Yoheho-bushi (Yoheho Rhythm). However, the lyrics of this song have been changed by Ujo Noguchi in Showa 8th (1933) but Yamaga local people love singing the original one since Meiji Era (1868~). The “Yoheho” is written in a unique dialect originally from the Higo region. It has often been used to excite people and convince people to drink. 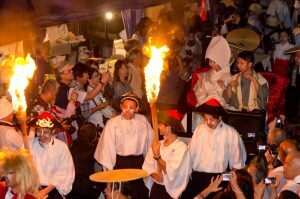 At the end of the festival, there is the “Agari toro.” This is when the Toroshi contributes the lantern (which was made for this moment) to God at the last night of festival days. This lantern is exhibited on the street corner throughout the festival term. The civilians carry it to the Omiya Shrine, while chanting “Haaai toro, Haai toro” on the way. In winter, there is an event called “Yamaga Lantern Romance” where traditional Japanese umbrellas and lanterns are hung and decorated all across the town. In the night, you can enjoy seeing the lit up objects, which differs from the daylight scenery. The picture of women wearing yukatas and dancing gracefully with golden lanterns on their heads reminds Japanese people of the nostalgia and beauty of Japan. Please enjoy yourself to the fullest. Access: About 5 minutes’ walk from Yamaga Onsen bus stop. Yamaga Onsen bus stop is about 40 minutes’ ride from Tamana Station on the Kyushu Sanko Bus bound for Yamaga Onsen. Tamana Station about 20 minutes from JR Kumamoto Station by Limited Express on the JR Kagoshima Honsen Line. The Naked Festival, called Saidai-ji Eyo, is a type of Japanese festival, in which thousands of men wear a minimum amount of clothing; usually just a Japanese loincloth (called fundoshi), sometimes with a short “happi” coat and rarely completely naked. Naked festivals are held in dozens of places throughout Japan every year, usually in the summer or winter. The most famous festival is the Saidai-ji Eyo held at Saidaiji Temple in the Okayama Prefecture. 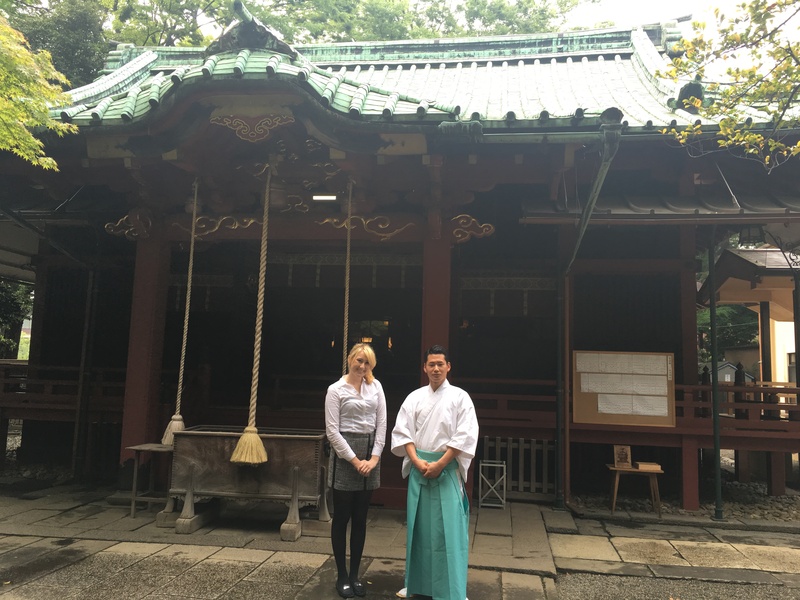 Saidai-ji Eyo is known as a festival for men but there are some women. At 7 pm, a group wearing white gowns comes to the Saidaiji Temple garden and prays for the safety and success of the festival. They also play the drums called “Eyo-taiko” to announce the beginning of the festival. That’s why there are a lot of people gathered at the festival- to gain good luck. 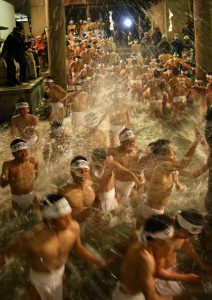 Nowadays, 100 O-fuda are thrown into a crowd of 9,000 naked men every year at the festival. The o-fuda was originally made of paper but was changed to wood because it was too fragile. So why are the men naked? 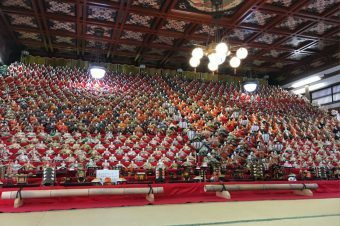 Originally, the men participated by wearing kimonos, but the kimonos would get torn up due to the roughness of the festival and how the men fought through the crowds to catch the sticks. Clothes became an obstacle. In order to move easier, the men started to come naked. Anyone can join in on the “Naked Festival.” “Tabi” and ”Fundoshi” will be sold on the festival day for those who participate. 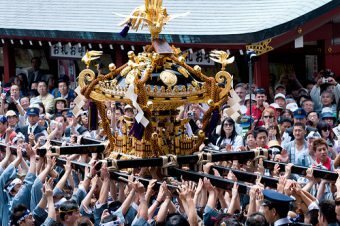 The town is extremely busy on the festival day, with over thirty thousand people coming to see and trying to share in the luck. By Express Bus: Take the Ryoubi Bus from Okayama Station bus terminal and get off at Saidaiji bus terminal. Then, 10 minutes to walk. 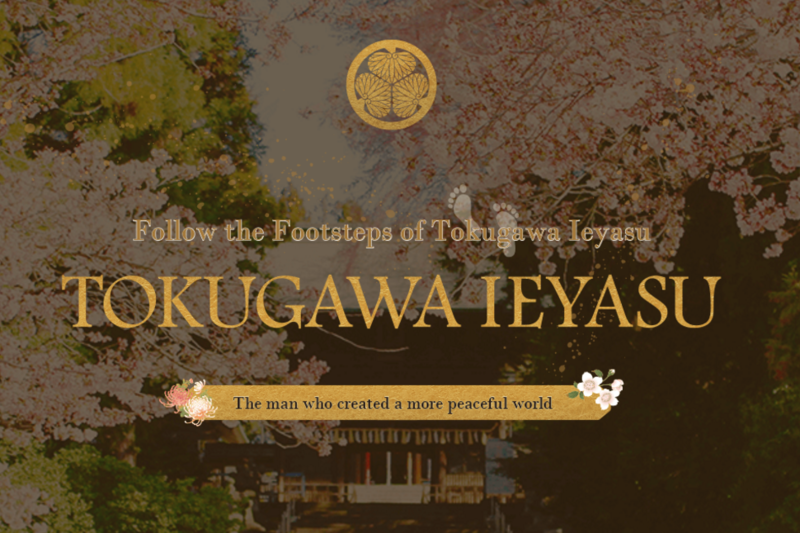 The Okayama Prefecture is located near to Kyoto or Osaka. The easiest way to travel there is by using Shinkansen or Express Bus.